Ed.note: see update: Dolly’s premature aging and death. A technological ‘world first’ happened when Scottish scientists recently performed the world’s first true ‘cloning’ of a mammal. The result — a sheep named ‘Dolly’. ‘Clone’ means a creature which is an exact genetic ‘carbon copy’ of another. Not just bacteria, but also some of the plant, amphibian and reptile species reproduce in this way, by ‘cloning’ themselves without the need for both a mother and father. 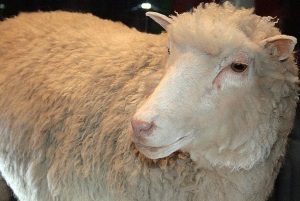 Dolly the sheep has been preserved through taxidermy and is on display at the National Museum of Scotland. Would a clone of Hitler be a Hitler? Every parent of identical twins knows, however, that each is a unique human being. Their differences would be even more magnified if they were to be raised in two different families. If a Michael Jordan were ‘duplicated’, the ‘clone’ would have his own unique set of life circumstances. Upon growing up, he may have no aptitute for, or even interest in, basketball. A Hitler ‘double’, given the right circumstances, could grow up as a peace-loving convert to Judaism! Christians also know that each person is more than just ‘matter + information’. He/she is also infused with an individual human spirit, is uniquely and separately created in the image of God, and is individually responsible if they reject God’s offer of salvation. Thus, if John Wesley had had a cloned offspring, there is no reason that the child would necessarily become a Christian, let alone a great evangelist — any more than an identical twin of Wesley would. All ‘genetic engineering’ by humans of the amazing DNA program of living things, far from confirming evolution, merely shows us creative intelligence manipulating an already-existing batch of information coded on DNA. Each cell in a sheep (or a human) — bone cells, liver cells, and so on, contains all the DNA information required to ‘spell out’ the development of the complete adult organism. However, such cells have most of the information ‘switched off’, except for that which allows them to function as bone cells, etc. Though not understanding all the mechanisms involved, the Scottish researchers managed to ‘trick’ the information in one of a full-grown sheep’s cells to ‘switch on’ again. They put the nucleus of one (mammary) cell from an adult sheep, A, containing its DNA information, into an egg cell from another sheep, B, which first had its nucleus (with its DNA) removed. This one cell could then start to grow and divide in the womb of another sheep, C, as if it were a fertilized egg. Notice that you need the machinery in the egg cell from B to express the information from sheep A. Thus, Jurassic Park’s becoming a reality would require not just a complete, uncorrupted batch of dino DNA, but also a live egg from a female dinosaur! All ‘genetic engineering’ by humans of the amazing DNA program of living things, far from confirming evolution, merely shows us creative intelligence manipulating an already-existing batch of information coded on DNA. But evolution is supposed to be all about how such information arose (and progressively increased) by itself, with no intelligence! Is genetic engineering good or bad? Before the Fall, mankind was given dominion over creation (Genesis 1:28). Scientific advances can be used for good — or for evil. Certain forms of genetic manipulation may help feed hungry nations3, or heal inherited diseases. However, in an evolution-soaked world increasingly hostile to its Maker, the fear that such technology will eventually be abused does not seem unrealistic. 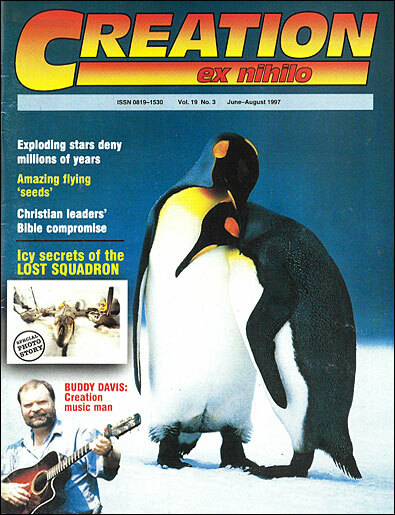 Dolly is not the first reported mammalian clone, but the first one which involved neither forced ‘twinning’ of an embryo, or implanting an embryonic nucleus. Such ‘adult’ cloning means one can first see what the adult organism is like before cloning. Return to text. A more macabre scenario is that of wealthy people contracting to have brain-dead clones ‘grown’ in order to be able to have a supply of perfectly matched replacement ‘parts’ for transplanting as their own organs wear out. Return to text. Cloning has been proposed for animals which, through selective breeding (also a form of genetic manipulation, in a sense) have outstanding commercial qualities. E.g. if you had a cow which could produce vast amounts of milk, then cloning it could generate an entire herd of supermilkers. However, this does not generate new information any more than breeding does, so is not relevant to evolution. All it involves is ensuring that a fortuitous combination of genes is totally passed on, (rather than the usual half). But those cows which had maximal genes for one trait would fail to carry some other genes in the population. If then all milk cows consisted only of such ‘supermilkers’, there would be a serious loss of genetic information from the population. Were a new disease problem to arise to which these were not resistant, those other cows which produce less milk would be the source to which one would need to turn for genes to confer resistance. Return to text.